The red-tail boa, also known as the Colombian boa, is a non-venomous snake found primarily in tropical South America. The red-tail (Boa constrictor imperator) is nocturnal and detects his prey with heat receptors located on his upper lip. His muscular body constricts, suffocating his prey by squeezing it. Boas are docile creatures and rarely bite humans. Although a stocky constrictor, the red-tail is smaller than other boa species. Females reach up to 10 feet long and can weigh up to 60 pounds. Males are smaller in length and girth, averaging up to 8 feet long. Reddish-brown tail markings give the red-tail his name. Expandable jaws allow him to open his mouth up to 150 percent wider so he can swallow his prey whole. The boa constrictor's average lifespan is 25 to 30 years. The boa is an ambush predator, grabbing his prey with his jaws and wrapping his long, powerful body around the animal. Squeezing his coils, the boa constrictor exerts 6 to 12 pounds of pressure per square inch from two or more body points. He doesn't crush his victim; however, he carefully suffocates the animal. Small birds and mammals have faster metabolisms, which require an uninterrupted oxygen supply; they often experience quick deaths. Larger mammals and cold-blooded animals have slower metabolisms and may endure slower deaths. 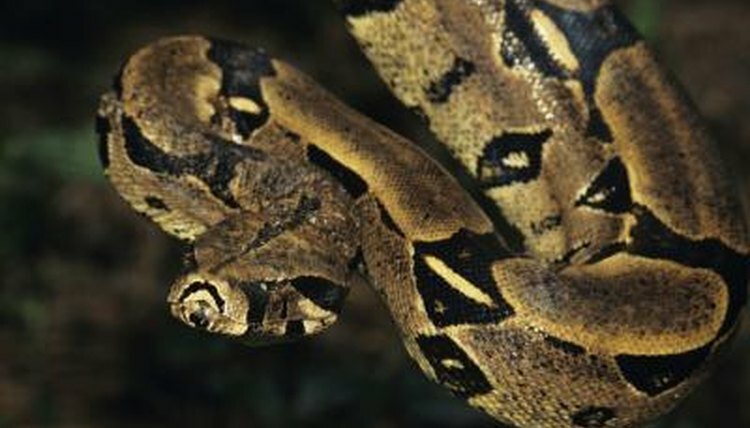 The red-tail boa can deplete large amounts of energy during constriction. Additionally, he risks getting bitten by his prey during the attack. Knowing when to stop squeezing conserves energy and prevents bites from prey released prematurely. The red-tail knows when it's safe to release the animal by monitoring his prey's heartbeat during constriction. He adjusts his coils' pressure, tightening them each time his victim exhales, and feeling the heartbeat as he squeezes. Curious about the pressure of a snake's coil, scientists at Carnegie Mellon University in Pittsburgh, Pennsylvania created a pressure sensitive device visually monitored with a laptop computer. A small, pressure-sensitive plate on the end of a probe is placed between the snake and his prey. The probe is wired to the laptop, which receives the data. They discovered that a constrictor can exert 6 to 12 pounds of pressure per square inch, depending on the size of the snake.